In the United States some 68 percent of households own a pet; in Australia, it’s around 62 percent. These are among the highest rates of pet ownership in the world. Of course, people have had animal companions for millennia and today there are literally millions and millions of loyal dogs, imperious cats, warbling budgerigars and surprised goldfish in homes across the world. But there are many who prefer something a little more unusual in the way of pets. Among his animals, Lord Byron had a pet bear, a few monkeys and apparently a crocodile. The pre-Raphaelite poet Dante Gabriel Rossetti had a wombat called Top, a zebra and an armadillo among his menagerie. Ernest Hemingway had a liking for six-toed cats. Here, for your reading pleasure, are some more creative people and their precious pets. Do you have a beloved tabby? Chances are your pussycat is nothing like the cat owned by eccentric Spanish surrealist artist Salvador Dali (1904-1989), creator of The Persistence of Memory (1931), Galatea of the Spheres (1952) and many other iconic works. A well-known cat lover, Dali bought himself a Columbian ocelot—which he named Babou—some time during the 1960s, equipping him with a gorgeous stone-studded collar and leather leash. Only the best for Babou. 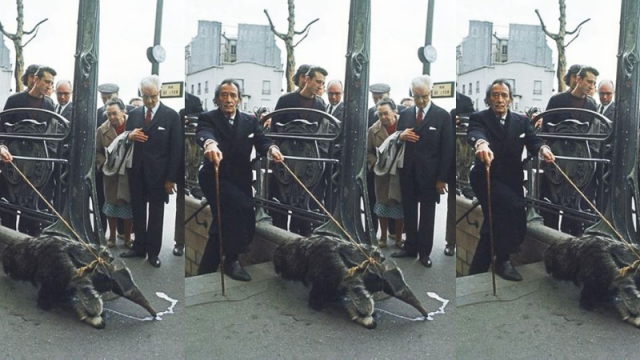 Babou accompanied Dali to parties, restaurants, shopping, and once even on an ocean cruise. It’s said that on one occasion in a New York restaurant, a woman was frightened by the ocelot, demanding that it be removed from the establishment but, unperturbed, Dali told her that Babou was nothing more than a regular cat which he’d “painted over in an op art design”. Meow. Henrik Ibsen (1828-1906) is one of Norway’s most acclaimed playwrights, having penned some of the most beloved of all theatrical works including Hedda Gabler, The Doll’s House, Peer Gynt and The Wild Duck. The stories go that when he was writing his 1866 dramatic poem Brand, the tale of a priest who is essentially willing to sacrifice all that is dear to him in order to stick to his principles, he decided to get himself a pet. But no puppies for Ibsen. Instead he kept a scorpion inside a large beer glass placed on his desk. This wasn’t at all a suitable environment for the poor arachnid and when it became listless, Ibsen would toss a piece of fruit into the glass which made the creature angry—hardly surprising considering a scorpion’s diet consists mainly of insects. Ibsen told his friends that the scorpion’s rage would result in it ejecting its toxins and then all would be well once more. He really would have been much better off with a Halden hound. Canaries, cockatiels, budgies—many people enjoy the twittering company of a small feathered friend. But for the author of such literary masterpieces as Oliver Twist, Great Expectations, A Tale of Two Cities and A Christmas Carol a little bird just didn’t cut it. Charles Dickens (1812-1870) famously had a pet raven called Grip which lived inside the house and although his family constantly complained about being pecked, Grip wasn’t going anywhere. Ravens are intelligent birds and Grip had a rather good vocabulary, inspiring Dickens to make him a character in his 1841 novel Barnaby Rudge. It’s said that Dickens sent the manuscript of that work to American poet Edgar Allan Poe who reportedly was so impressed with the raven’s ability to tap on Dickens’ doors that he himself later wrote his most famous poem, The Raven. When Grip died in 1841, Dickens had him professionally stuffed and mounted. If you happen to be in Philadelphia, you can see Grip in the Rare Books section of the Philadelphia Free Library. Mexican artist Frida Kahlo (1907-1954) is known for the passion and pain she brought to her paintings, particularly when she was her own subject. Frida loved dogs, her favourite breed seemingly the Xoloitzcuintli—the Mexican hairless dog—sacred to the Aztecs; she also had a pet deer and she loved birds. She kept an eagle named Gertrudis Casablanca and a parrot called Bonito. But perhaps most famously and poignantly of all, she kept spider monkeys, important in Aztec culture where they represented art and sexuality, and which for her symbolised the children she could never have following the horrific accident she suffered when she was 18. Of the 55 self-portraits she painted, eight of them include her house monkeys. Speaking of monkeys, when he lived in India the Polish-born English novelist Joseph Conrad also had a pet monkey. But when he returned to England, keeping the animal in his lodgings was frowned upon. He didn’t know what to do but the problem was quickly solved by the monkey itself: when it destroyed some of Conrad’s papers, the author was immediately prompted to sell it. Exotic animals are beautiful and fascinating creatures but there’s a reason most people choose instead to have a more reliable pet. Sit Fido, sit. Good boooyyyyyyy.